What Brainwave are you looking at? 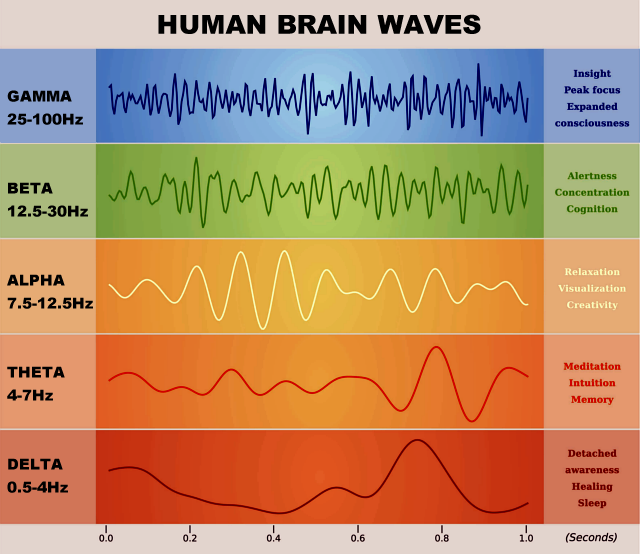 Brainwaves are generally classified into 5 distinct frequencies or speeds – gamma, beta, alpha, theta, delta – and our state of consciousness depends on which waves are dominant. Gamma waves (25—100 Hz, 40 Hz Typical) Gamma waves have been shown to reveal a cohesive, organized state of mind that includes binding of many perceptions into a unified whole. Beta waves (12.5—30 Hz), which dominates our normal waking state, has been subdivided into SMR (12-15 Hz), beta (15-18 Hz) and high beta (19-36 Hz). Alpha waves (7.5—12.5 Hz) are characterized by calm, relaxed and meditative feelings, day dreaming and unfocused thought. Theta waves (4—7 Hz) emerge as you drift off to sleep; this is the “twilight,” hypnogogic state in which dream like images can surface. Delta waves (.5—4 Hz) are dominant during sleep. Mu wave (µ) The Mu wave is similar to the alpha wave, but occurs in a different part of the brain. With neurofeedback “brain training” the Mu wave has been shown to help children with autism. Focused concentration, mental acuity and mental activity are characteristic of beta. High beta (>18 Hz) may be described as a hyper-alert state, sometimes leading to tension, anxiety and agitation. A healthy person will shift through the different states dependant upon the task-at-hand. Different activities require different brainwave states. Increased theta is adaptive when we are drifting off to sleep, for example, but not when we are driving a car. Brainwave training protocols are designed to enhance brain function by increasing the brain’s production of “situationally healthy” brainwaves and decreasing the presence of “situationally unhealthy” waves. Training protocols affect a combination of signals, depending upon therapy goals and any brainwave dysregulation that may be present. There are specific protocols appropriate for different problems, but each protocol is individually designed to fit the person. What does it mean to have an over aroused or under-aroused central nervous system? A healthy central nervous system shifts quickly and smoothly from one arousal state to another appropriately depending on the task at hand. The parasympathetic and the sympathetic nervous system work together by complimenting each other. In simple terms, the parasympathetic is calming whereas the sympathetic is stimulating. For instance, the sympathetic may trigger a “fight or flight” brain wave pattern but the parasympathetic should take over as soon as the danger is passed. Sometimes our brains don’t receive the message that the danger has passed and high anxiety and even panic attacks can occur. Too often our brains become stuck in a high or low arousal brain wave pattern inappropriately. Every activity or state of consciousness is associated with a specific brainwave pattern. Healthy brains are able to shift quickly and smoothly from one state to another depending on the task they are engaged in. A brain may be under-aroused, responding slow, and sluggish or even unresponsive or it may be over-aroused, reacting too quickly, anxiously and even before the message has had a chance to reach the frontal lobes to logically evaluate the situation. Our brains can become stuck either ‘on’ when it needs to shut down, relax or idle; or they may become stuck in the ‘off’ position when it needs to wake up, focus, and respond. The brain’s state of arousal at any given time can affect our emotions, thought processes and mood states. The beauty of neurofeedback is that enables the brain to learn how to more efficiently switch states, resulting in greater self-regulation and flexibility.